Why brew a light, refreshing “lawnmower” ale to be enjoyed after yard work when you can brew a batch flavored with lawnmower clippings? Well not literally, but this is a batch of sour beer flavored with ingredients foraged from what would otherwise be clipped. A beer that captures the aroma of summertime in my backyard! use the Creeping Charlie in that picture! I met Carlos, my brewing partner for the day, back in February when Blane invited us to brew (with juniper, smoke, and kveik). Carlos is an enthusiastic forager, and talked about a variety of exciting projects like malting his own quinoa for a 100% quinoa beer! We’d been looking for an excuse to brew together again since, so this was perfect! I hadn’t heard of ground ivy beer previously, but in addition to being an invasive species, it is a historic English/saxon brewing herb (often called alehoof). Brewing herbs growing wild is a great argument for lawn as a meadow in addition to avoiding the use of fertilizer and herbicide! Crushed, alehoof smells a bit like parsley crossed with arugula, green but not grassy, a little peppery. That flavor is rich in terpenes, phenols, and vitamin C. The list of volatiles in this study for Glechoma hederacea is so long that it is difficult to pick out what compounds are responsible for it's flavor. However, it contains many of the terpenes in hops including important aroma molecules: humulene, caryophyllene, linalool, and traces of myrcene and geraniol. 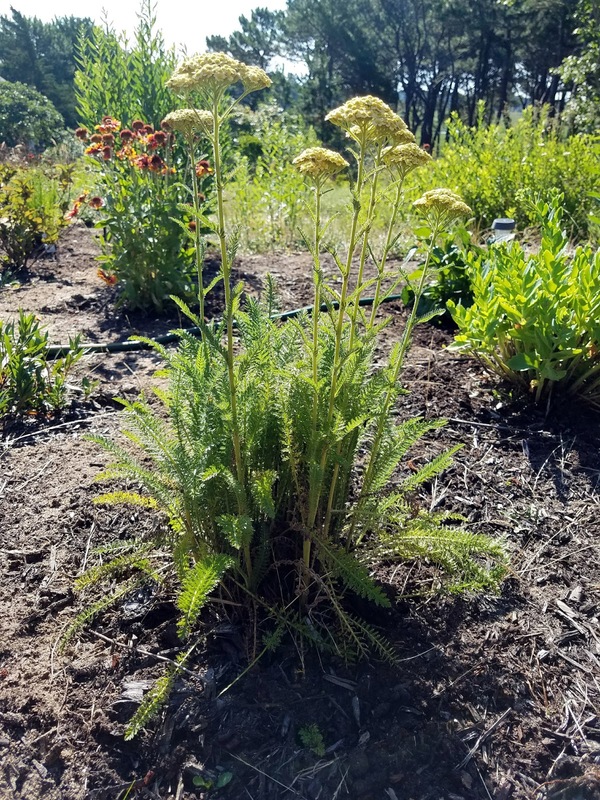 When I visited my parents a couple months later, my father showed off the yarrow in his garden on Cape Cod (a few feet from where my mead is buried). Another classic brewing herb! I had read that yarrow loses its most interesting aromatics during drying, so this was a rare opportunity to try it fresh. β-pinene, linalool, and β-caryophyllene are found in yarrow and hops, so another chance of a beer with flavors reminiscent of a wet hopped ale? I actually have a keg on wine-barrel solera still sitting in my basement with fresh yarrow from Spruce on Tap that I purchased when I brewed my India Pale Gruit... I should probably pull a sample. For the alehoof usage-rate I referenced Sacred and Herbal Healing Beers (3 oz dried/12 quarts per roughly three gallons), and Growler Magazine (6–8 quarts per 5 gallons). Both sounded like a lot of an herb I'd never tasted in a beer, so I went easy with two quarts in 11 gallons at the start of the boil. We split the yarrow adding the leaves with the alehoof, and the flower heads and stems in the whirlpool treating it like aroma hops. Again though, 2 oz in 11 gallons is less than most recipes I could find. Carlos brought a bag of pink salt from Maras, an Incan salt production facility still in use today. A stream of subterranean brine in diverted into shallow pools and allowed to evaporate. The light reddish color comes from traces of iron. Iron isn't a positive beer additive, but using ancient salt is romantic with traditional herbs. Salt is a classic part of gose, and can help meld bitterness and acidity (as in a salad). We planned to split the batch, but Carlos had a flight to Peru a week after brewing to cover between head brewers at a small brewery. I revived Right Proper's House Lacto culture (which did good work in my lone qunioa beer) and pitched the other half with GigaYeast's Sour Cherry Funk. I didn't have a plan for that pack, so this seemed like a good test. It is still in the fermentor, this tasting is of the Right Proper half. Smell – Slight spicy and herbaceous aroma. There are some green notes that with the knowledge of what is in there reminds me of mowing. Luckily it doesn’t remind me of boiled greens. Not an overpowering or aggressive gruit/herbal character, allowing room for grainy maltiness to come through. Appearance – Glowing yellow, cloudy. Dense white head. Better head retention than my previous efforts with this culture. Still not fantastic, but enough to snap a few pictures in the backyard. Good lacing. Taste – Big lactic acidity, tangy. Minimal sweetness and bitterness. There are herbal notes, but also a citrusy (orange and lemon) character I usually associate with lightly dry-hopped sours. Mouthfeel – Light and bright. This is the second sour in a row on tap that doesn’t seem to be getting as carbonated as the other taps despite the same pressure. Could be a little bubblier. Drinkability & Notes – The sourness is at the high end of what I’m looking for. The pH reading was 3.03, but it doesn't taste quite that sour. Otherwise refreshing, just not the sort of beer I naturally gravitate to for a second pour. Changes for Next Time – I’m satisfied with the experiment. The fresh herbs do lend a fresher flavor than dried herbs, less concentrated and distinct. Doubling the herbs would create a more “obvious” flavor, but as a beer on tap subtlety is a virtue. I’ll wait for the other half to see how it compares with age before making final proclamations on the process. Made a 3.5L starter with the Right Proper House Lacto culture that had been sitting in my fridge for... six months. Seemed to start up well. Ground ivy harvested from the backyard that morning. Yarrow harvested three days prior on Cape Cod. Chilled to 80F and pitched RP Lacto (left at 80F). Other half left at 65F for 6 hours to drop a bit cooler before pitching Cherry Funk (left at 65F). 7/22/17 Racked the Giga half to secondary (1.012, mildly tart). 7/26/17 Kegged the Right Proper half with 3 oz of table sugar to carbonate (1.009, firm acidity). Seal was not good, didn't hold pressure. 8/6/17 Moved the Right Proper half to the keggerator, fixed the lid, and attached to gas. Final pH 3.03... not confident in that reading. 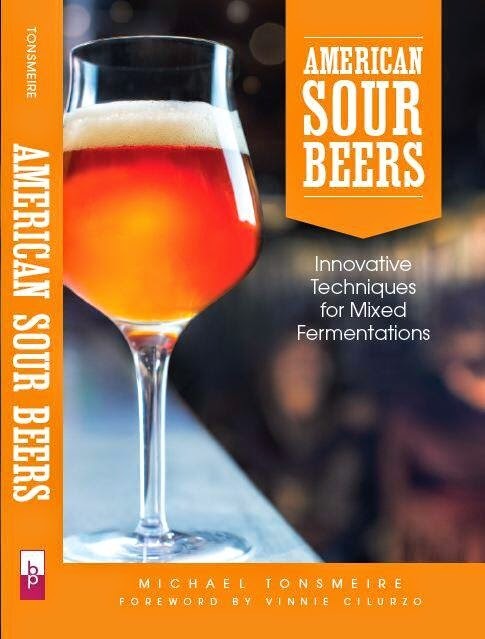 I get a commission if you buy something after clicking the links to MoreBeer/Amazon/Adventures in Homebrewing! I am really suprised to see how nice is the head without hop. Nice job! I was pleased. I was extra careful cleaning the glass, sprayed with some StarSan to ensure it was oil-free. Is there any reliable way to determine how much herbs/spices/plants ought to be added to a gruit (particularly for bittering)? I've been kicking around a few ideas for about a year now but have been hesitant to pull the trigger on any of them because I'd likely be using dry (re:expensive) ingredients. There isn't a simple IBU or alpha acid equivalent for herbs. You'll have to do some tests, say making a tea (boiled vs. steeped) to get a sense for how intense the aromatic and bittering characteristics are. Not all herbs get more bitter with extended boiling, isomerization isn't always required. Start with a small batch and experiment to figure out what works if you are worried, or just start low (as I did). What herbs are you planning on? Did you consider adding any of the herbs to secondary? I did a Japanese knotweed Berliner weisse in the spring and found that of the two versions (one with jk adding during the boil and the other during secondary) that the extended contact time in secondary (about 3 weeks) brought out the most flavor and aroma and it tasted brighter/cleaner. The boiled version tasted very vegetal. With such a large amount of green material, I was worried the ground ivy might turn it grassy. Maybe after the other half ages I'll give it a final aroma boost with more herbs before bottling. Benefit depend if the aromatics are more soluble in alcohol than water, and if they benefit from exposure to fermentation. I want to go floral, I think: elderflower, chamomile, lavender, and perhaps dandelion greens for bittering.